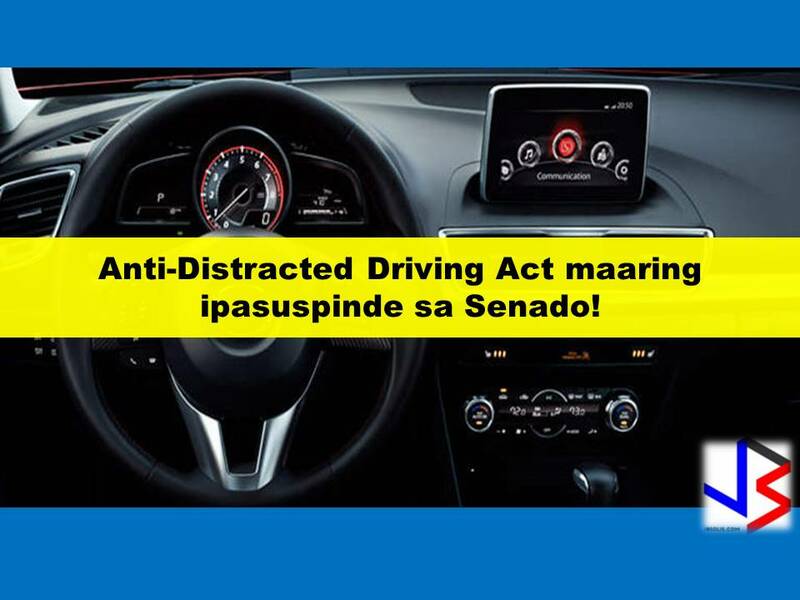 Senators would like to suspend the Anti-Distracted Driving Act that is recently being implemented in the Philippines. The reason for the suspension, they only wanted to make driving safer but the implementation has been very complicated as it has required several things that are quite unreasonable for many. 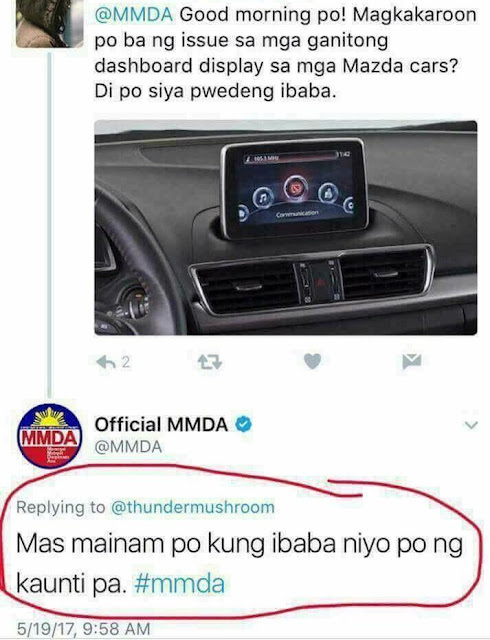 What is RA 10913 or the Anti-Distracted Driving Act? gadgets while vehicles are in motion or temporarily stopped on a traffic light or an intersection. A motorist, as defined under this law, is a person who is driving motor vehicle." The law was passed in order to protect and make driving safer. What does this law prohibit? movies, performing calculations, reading e-books, composing messages and surfing or browsing the internet." It is meant to prohibit drivers from using the cellphone while driving. 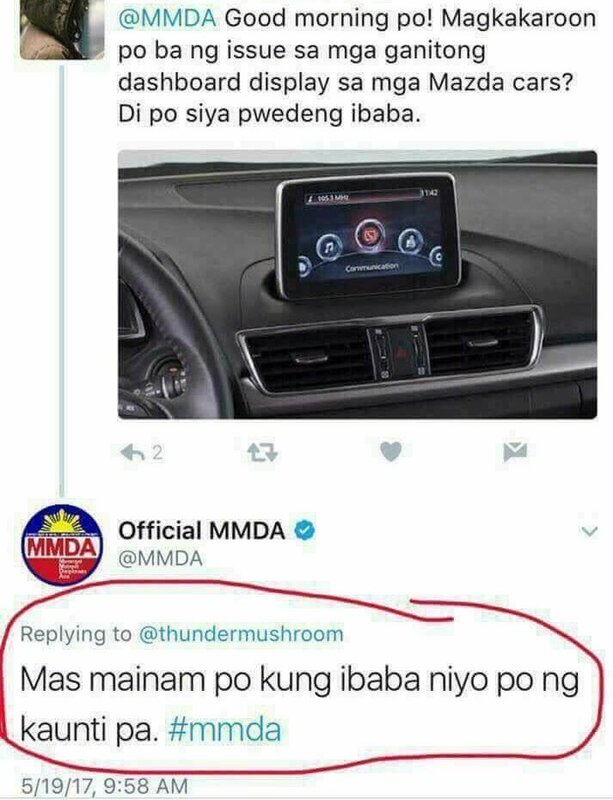 But on the implementation, drivers are also prohibited from using the phone to read e-books, play games, or make calls even when the car is not moving during traffic. Items on the dashboard is also prohibited, these includes air freshener, decorations including rosary. Navigational devices such as GPS, are allowed however it is required that they be placed below the dashboard or to prevent obstruction of driver's view if placed on the dashboard. Driver's however are complaining that it is more dangerous to look down when following the navigation device. Can we still use traffic and navigational apps like Waze and Google Maps while driving? areas that will not obstruct the driver's view. In cases when motorists need to find alternate routes while in traffic, they are advised to first pull their vehicles aside." 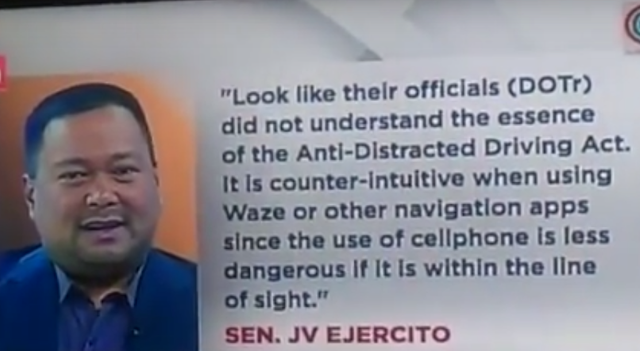 According to Senator JV Ejercito, it is counter-intuitive when using navigation apps. The use of cellphone or navigation device is less dangerous if it is within the line of sight. it is more dangerous if the driver has to look down when following navigation. of driver's license and a fine of twenty thousand pesos (Php 20,000)."